- formed about 25 million years ago by the violent separation of two of the earth’s continental plates floating on the molten magma of its core. - 4,000 miles long, from the Red Sea to Mozambique, and its sides are still moving apart, slowly but imperceptibly. - slow separation brings dramatic outpourings from the molten core which have created volcanoes, mountains and escarpments. - the Rift is a long fissure in the landscape and water collects in depressions and has no way out except by evaporation which leaves sediment and salts behind. We know these depressions as lakes and wetlands, but here they are unique because of this geological accident. The accumulation of salts by evaporation can eventually produce caustic soda water. Very few species can live in such harsh conditions, but those that can, do so in spectacular abundance. Lakes Bogoria, Nakuru and Elmenteita are soda lakes that can be bright green when viewed from space because of the huge density of spirulina. Spirulina, a micro-organism, a blue-green ‘alga’, is the main food of the lesser flamingo, an animal highly specialized to filter the microbes through its beak. The intense green of the lake waters often contrasts with the vivid pink of the flamingos gathered along the shores. Up to a million birds congregate on a single small lake creating “one of the top ten bird-watching spectacles in the world”. Flamingos cannot drink soda water ­ they have to use the same few freshwater springs and streams at the edge of the lake for drinking and preening as the local people use for their homes and their cattle. Helping to reconcile potentially conflicting uses of precious freshwater in the dry lands of Kenya, is at the bottom line of this long-running Earthwatch Institute-funded project. 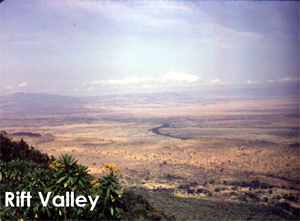 Nowhere is that man-nature conflict over water use more acute than at the two freshwater lakes ­ Naivasha and Baringo. Geological accidents keep them fresh against the odds. In a land full of volcanoes, hot springs and faults, water flows out of Naivasha ­ underground - taking dissolved salts with it. Both lakes have drainage from high altitude and high rainfall areas, a considerable distance away, give them great inflows. 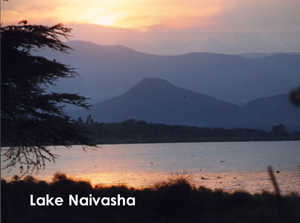 Lake Naivasha’s fresh water supports the largest area of horticulture (cut flowers and vegetables) in the country and the industry is Kenya’s largest export earner besides tourism. Amazingly, Naivasha’s ecology still supports very high bird diversity. 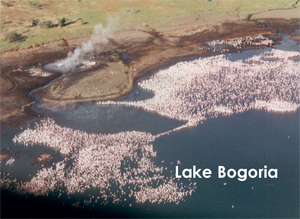 Lake Baringo lies in the more arid, lower altitude part of the Rift about 150 miles north of Naivasha, just north of the equator. There, the soils are fragile and easily eroded, the climate unpredictable and harsh. The result though, is a starkly beautiful lake, bright brown in colour (which comes from the soils) and set against a backdrop of the Tugen Hill, which supply its drainage. Lake Baringo’s high biological diversity needs scientific understanding to help save it.